2015 marked another challenging year for the Construction Workers Health Trust. 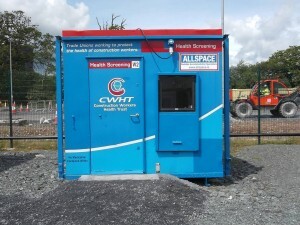 Despite a further reduction in income the Trust still provided screening to just under 5,000 workers on site throughout the country. For those of you who don’t know much about us, the Trust is a registered charity managed by a board of Trustees drawn from the various trade unions. That said, there is no industrial relations at work here, this is simply about good health. Traditionally workers who were members of the pension scheme were also enrolled in the Trust and our funding rose and fell with the fortunes of the industry. However all that has now changed. Of the approx. 20,000 workers currently paying into the Pension scheme (CWPS), roughly half are also contributing to the Health Trust. This leaves a shortfall in funding that the Trust is currently meeting from its accumulated reserves; a situation which is unsustainable. Employers may recall the confusion some years back when invoices from the Pension Scheme separated the constituent parts of the weekly contribution and pointed out that while the pension and sick pay elements were at that time mandatory, other parts of the payment including Health Trust and Benevolent Fund were in fact voluntary. This resulted in some firms reducing their weekly payment to pension only, although the additional components were actually worker only deductions with no employer contribution. The striking down of the Registered Employment Agreement by the Supreme Court has further exacerbated matters to the point where the future of the Health Trust may now be in jeopardy. Despite this the Board remains committed to its remaining membership and this year we plan to launch an online nutritional advisory service. Members will soon have the facility of contacting our own online nutritionist who will advise on matters such as food supplements and the dietary requirements best suited to people managing with diabetes, celiac disease, asthma, weight management and a wide range of everyday conditions. This service is not subsidized by any product manufacturer and can therefore give honest and impartial advice to those who wish to avail of it. For 2016 all workers visiting our on-site nurses will continue to receive a thorough medical which includes tests for blood pressure, cholesterol, BMI, diabetes and lung function. The diabetes test is particularly important. Diabetes and obesity are the two biggest problems facing the population at present and construction workers are a particularly vulnerable group. It is estimated that as many as 250,000 Irish people may have undiagnosed diabetes, and will only become aware of it when they present to their doctors with some other complaint. Firms who wish to avail of our services can enroll their workers directly with us without the need to enroll with the Pension Scheme. The cost is a very modest €75 per worker per year and companies can decide themselves how to apportion the cost. In return your employees will be entitled to a comprehensive medical carried out in the workplace every 2 years, at a time of your choosing, and will also have online access to our nutritional advisory service. To get the ball rolling simply contact our office for an on-line application form and we’ll do the rest. When you consider how much your company spends on Health & Safety, what with hard hats and high-visibility jackets, shouldn’t you be spending some of it on your own health?